Donations are very steady, and Pallium is able to secure funding for the running costs of 500 Euro a month for the coming year. 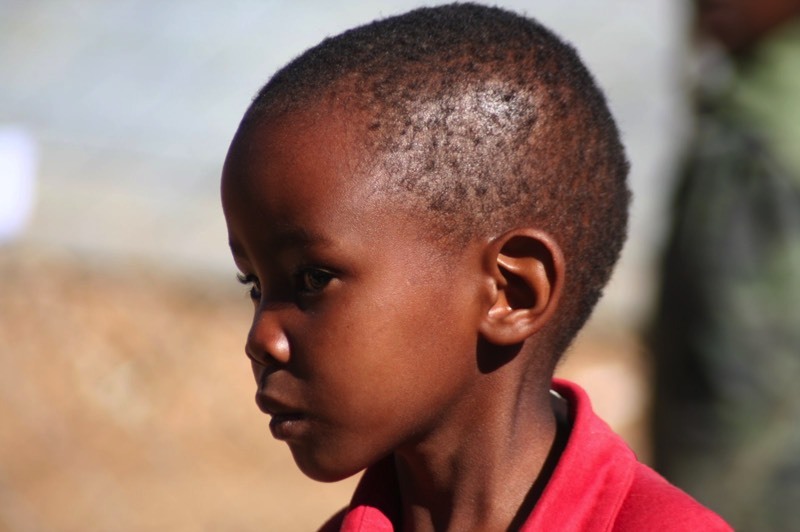 The Christmas party for the children is provided through AGRA Namibia. Further support for the Havana-Soup-Kitchen has been promised. The proposal for the erection of the shade-roof and the levelling out of the grounds are approved by the German embassy. Reports from visitors to the Havana-Soup-Kitchen prompt the formation of small donation networks in Germany. The first sponsorships are established as well as collections made in Freiburg, Gießen, Hergatz. Donation from DHPS: trays, tables and benches. Learning can begin! The mattresses that have become dirty are thrown out. Report on the development of the project through Pallium e.V. in Gießen given by Annegret Trübenbach-Klie. Frieda organises a small flee market with donations of clothes; proceeds go to the project. Havana-Soup-Kitchen is admitted into the food donation project Imago Dei. Financial administration of the project reorganised. Consultation with the bank takes place. Gaby Voigts (Krieger) takes over the Online Banking and supervision of financing. This allows for accurate book keeping and planning. Gaby oversees the project and is Frieda's contact-person. 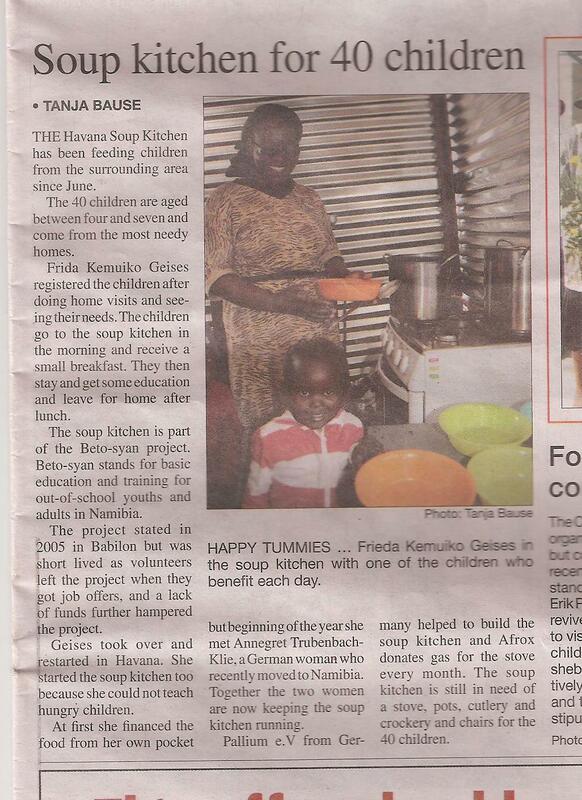 One of the first year classes from DHPS Windhoek visit the soup kitchen. The children sing songs for each other. Wika Prinz Max presents them with a poster from the WiKa Carnival Parada 2010. A meeting with all of the staff and volunteers of the project is held in Eros Park. Everyone engaged with the project attends. Future steps for development and problems are discussed. Frieda reports on the daily work. In attendance: Frieda Kemuiko, Simon Geiseb, Karen and Jens Dietzel, Joe Walter, Sabine Hoffmann, Gaby Krieger, Annegret Trübenbach-Klie. Development of a support network. The project is becoming more well-known and the first donations are received: a large donation of toys allow for the first experiences with Lego. Frieda further develops both pedagogical and organizational aspects of the morning care program. Open house: Parents of the children, supporters, the press and others interested in the project are invited. 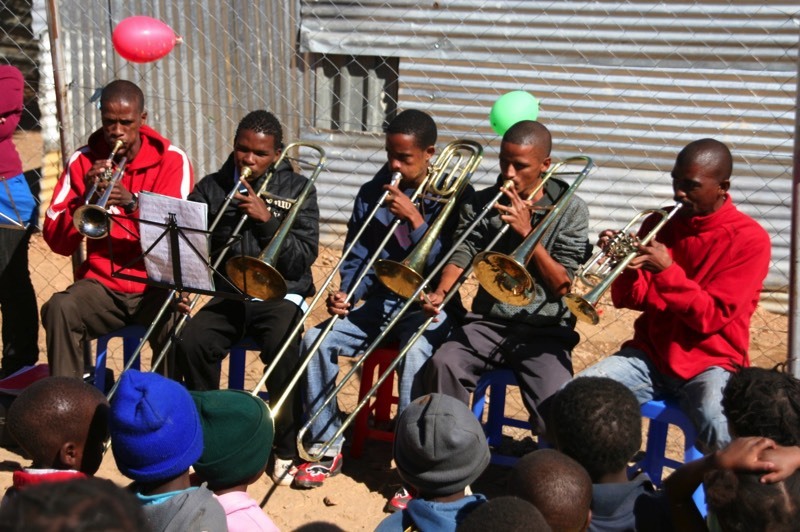 Youth from Okahandja Park provide for musical accompaniment with brass instruments. After celebratory speeches and a performance by the children, the project organisers sit with supporters and others interested for round of discussions about the development of the project. 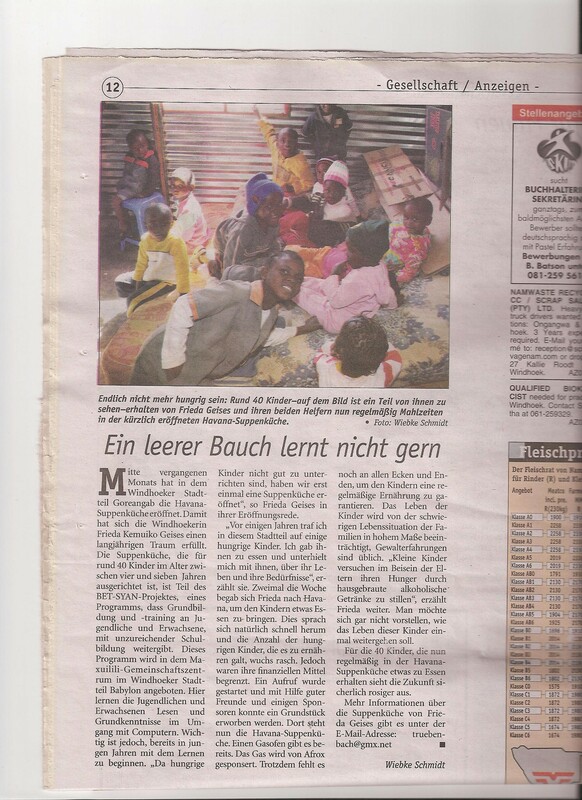 Further donations are collected in Germany allowing the soup-kitchen to be equipped. Support for this is approved by Christine Bruker and Annegret Trübenbach-Klie from Freiburg. Student group from Germany help with initial work on the premises and the neighbourhood and parents take part. The erection of the building is financed by Pallium e.V. 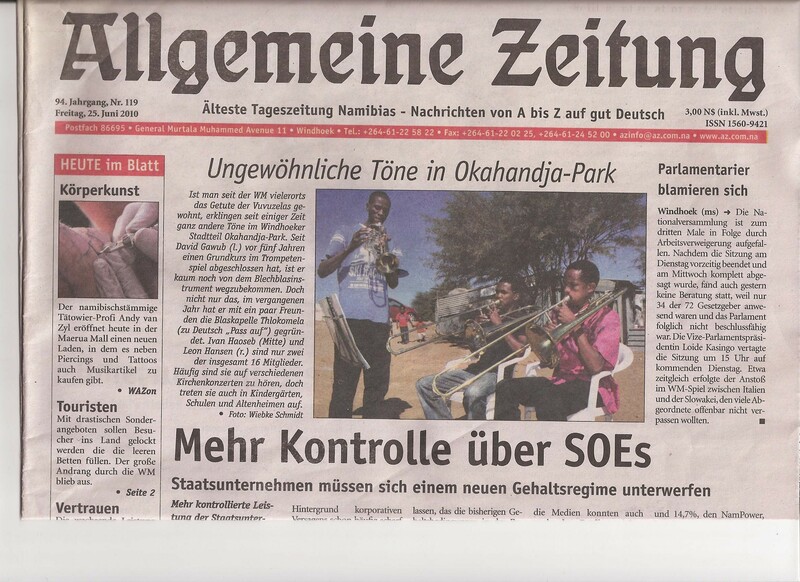 Development of the project idea: Bet-osyan (Basic Education and Training of Out of School Youth and Adults in Namibia). Official approval of the project. First donations collected in Windhoek. Acquisition of premises in Havana.